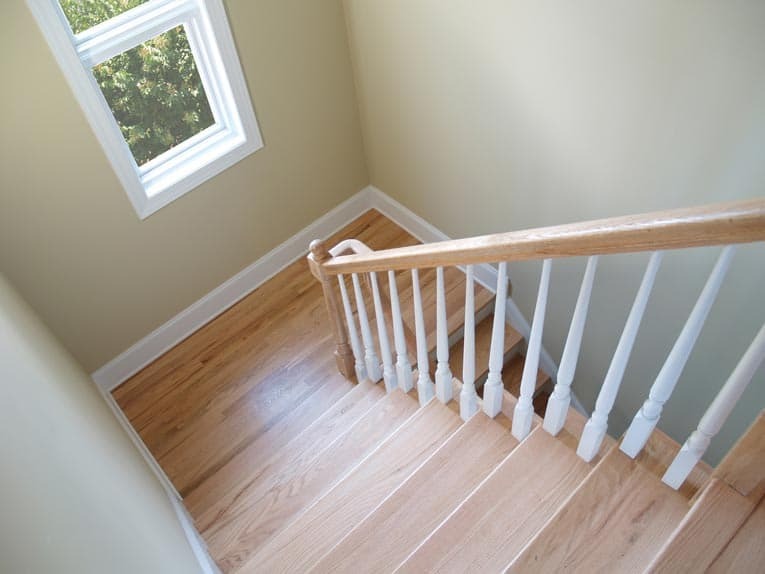 Hardwood stairs with a sturdy railing and landing provide for safe, easy movement from one level to another. Curving circular custom staircase is beautiful in both form and function. 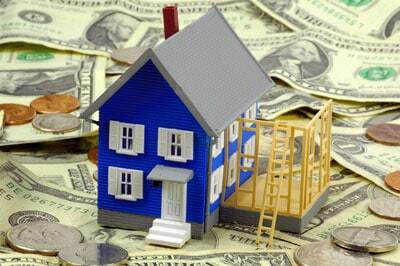 Expert, unbiased advice on how to plan and buy staircases for home remodeling projects. 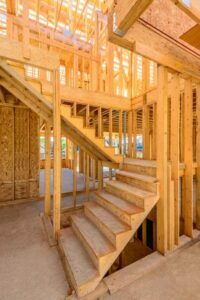 Whether you’re building a two-story addition or perching a deck over your backyard, any improvement that involves more than one level will include stairs…and this means you’ll have some important decisions to make. The staircase you employ, after all, can make or break your project’s success—both functionally and aesthetically. Functionally, they must provide easy and safe passage from one level to the next. Aesthetically, they may serve as a powerful design element, presenting strong vertical line, rhythm, and pattern or graceful forms. Indoors and out, a stairway is an opportunity for creative, sculptural expression. 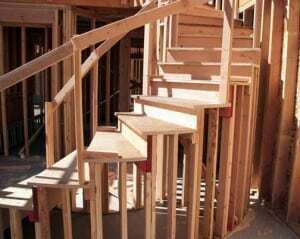 Framing for conventional built-in stairs is complex to build. Unfortunately, most conventional stairs are relatively difficult and expensive to build—particularly handcrafted, hardwood varieties. If custom, handcrafted stairs are what you want, find a stair maker or craftsperson that specializes in them. Review their portfolios, and get at least three bids. If you need help locating stair specialists, check out this free service: Find a Pre-Screened Local Staircase Construction Contractor. But be aware that there is a solid alternative to going this route. Contractors and do-it-yourselfers can choose from a wide variety of high-quality pre-built and ready-to-assemble stairs that are far more affordable and much easy to install. Below is a complete discussion of this option. Determining where to locate a staircase and the right type and shape of stairs to install can be challenging. If you’re doing new construction, where the sky is the limit in terms of design, stair location and type should be worked out by a trained interior designer or architect during the space planning phase of developing construction drawings. If, on the other hand, the scope of your project is smaller and the location of the stairs is pretty much a given, you may be able to selecting the best options is doable. Available space is key to determining a stair’s shape. 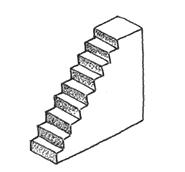 Stairs may be spiral, straight, circular, or any of several other shapes. And, of course, they may be wide or narrow, steep or gradual. As a general rule, the wider the stair and more subtle the climb, the more inviting the staircase—but also the more floor space it will consume. Straight stairs are the easiest and most affordable type to build. But because stairs with a landing-L-shaped or U-shaped stairs-are safer and easier to climb, they’re often preferred where space allows. Circular stairs take the least space but are also the hardest to climb. In fact, homes with a circular stair often also have another stair that provides easier access for moving furniture and similar needs. Following is a closer look at the major types of stairs, and then you’ll find help for buying pre-made versions of each. 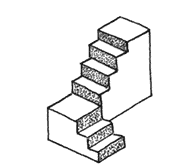 A straight stair stretches from the lower to the upper level in one straight run. Though this is the easiest type of stair to build, it can be difficult to squeeze into a floor plan. An “L” stair makes a 90-degree turn at a landing. A winder serves like an “L” stair but requires less space (but is less safe to use) because the landing is divided into pie-shaped steps. A circular stair generally sweeps in a broad curve from one level to the next. A spiral stair twists around a center pole in one of two ways. 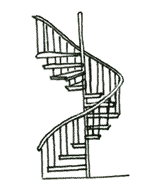 The common spiral stair has a straight center pole with steps radiating out from it; a helix-style spiral has a curving center support that follows the sweeping twist of the stair. Most types of straight, return, and L-shaped stairs are built on site by carpenters, but you can also buy these pre-made. Some manufacturers build conventional hardwood stairs in sections, ready to connect end-to-end or at landings. These simple, carpenter-built straight stairs are enhanced by a handsome hardwood railing. Stair Systems, for example, manufactures unfinished, shop-assembled sections that can be installed by two workers in about an hour using nothing more sophisticated than a hammer, level, and drill. Stock stair and railing designs, which can be delivered within two weeks, range from Colonial to contemporary. Most stairs cost from $1,000 to $2,000, but for custom-designed products, the sky is the limit. Hardwood stair system is custom made on location, but railing is made from standard-sized components that are designed for easy assembly and minimal customization. Mylen manufactures stair systems that have a contemporary, open look, with stair treads held only by single or paired stringers. Steel stringers are pre-welded to support oak, pine, or mahogany treads. You simply bolt the stringers to the header and floor and then bolt the treads to the stringers. Balusters bolt to the treads and handrail. Of the many available pre-built and knock-down stair kits, spiral stairs are by far the most prevalent, no doubt because they’re relatively economical in cost and space usage and because they can provide alternative access away from the central “staircase core” of a house. Spiral stairs are ideal for reaching attic or basement rooms and for two-story additions. They are also a popular choice for secondary access to rooms. 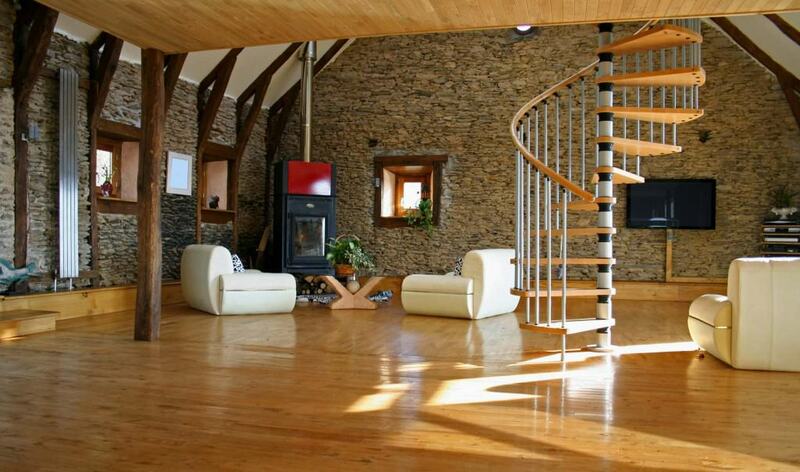 Spiral stair consumes minimal space and offers a lightweight, sculptural appearance. 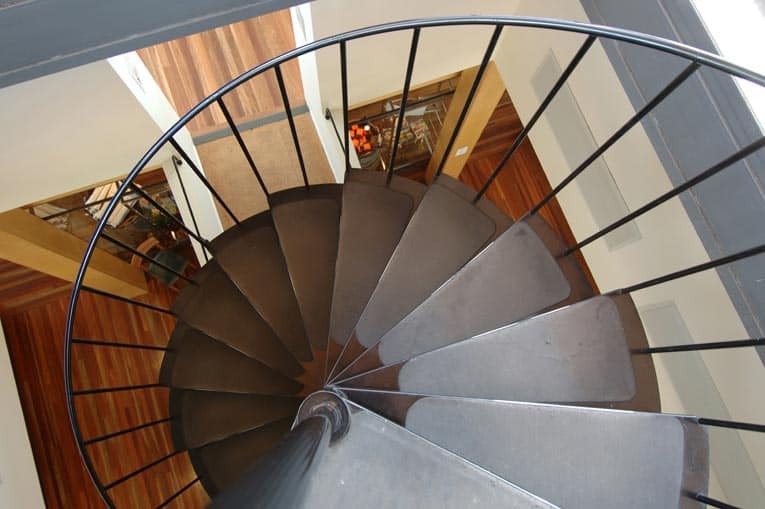 Manufacturers make spiral stairs in steel, aluminum, hardwoods, and combinations of these materials. Although some specialize in making only hardwood or metal, many companies make both. They typically offer a few basic designs that can be customized by selecting from a smorgasbord of treads, balusters, railings, and other options. 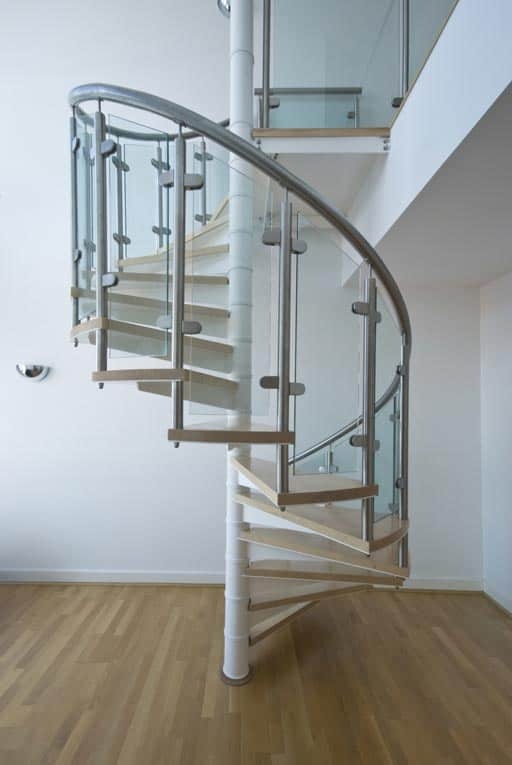 This spiral stair features a combination of structural metal, wood treads, and glass railings. The range of options is vast. 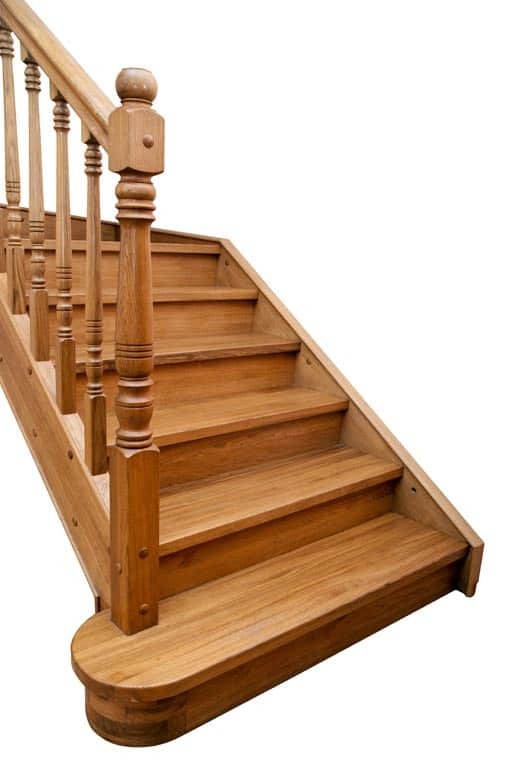 Hardwood stairs come in red oak, poplar, white oak, ash, walnut, mahogany, cherry, and other species. Steel and aluminum stairs come in a variety of finishes, from hot-dipped galvanized to custom color coatings. Treads may be flat or embossed steel, gratings, hardwood, rubber, or plywood, or steel base for carpeting. And so on. Boston Design Corporation even offers “illuminated stairs”—with one model, low-voltage lighting is radiated from the column under 3/4-inch frosted tempered glass treads. When ordering a spiral stair, you usually choose the direction of twist (right hand railing up or left hand railing up) and you always specify the diameter. Most manufacturers offer several standard diameters: 4 feet; 4 feet 4 inches; 5 feet; 5 feet 4 inches; 6 feet; 6 feet 6 inches, and larger (for safety, stairs 4 feet in diameter and smaller are not recommended). Moving up and down a spiral stair can be daunting and downright unsafe for children, the eldery, or anyone who is a little unsteady. 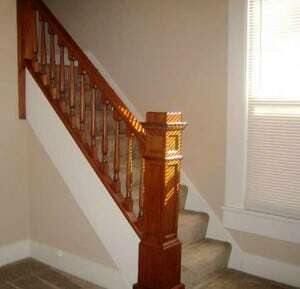 The width of the inner tread and security of the railing is very significant to a staircase’s safety. One key choice you must make when selecting a spiral stair is whether to buy a knocked-down kit or a complete one-piece unit. Though kits are cheaper and considerably easier to ship, one-piece stairs tend to be more durable, are less likely to come apart or rust because they have fewer joints, are lighter in weight, and can be installed in as little as ten minutes compared to three or four hours for a kit. One-piece units also afford a much broader choice in materials—particularly railings—because they’re not constrained by the need for easy disassembly and shipping. Many kits, for example, come only with flexible vinyl railings. Kits start at about $400 for small-diameter, standard steel models. One-piece steel stairs start at about $500. Aluminum stairs are lighter to ship, but the material is much more expensive—they start at about $1,500. All-wood or metal-and-wood stairs run from $2,000 to $5,000 or more. 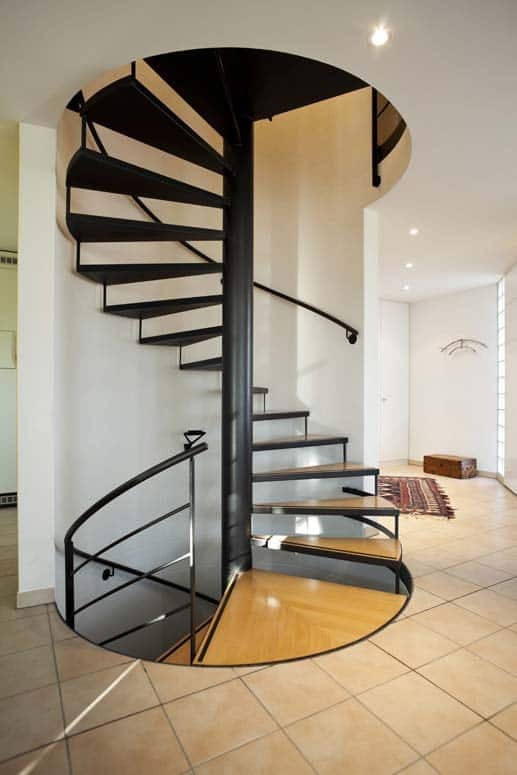 Contemporary design of this spiral staircase is accented by black steel, hardwood, and sweeping lines. Though we love the look of this staircase, we don’t like the way the railing ends four steps from the floor—this might not pass code in certain areas. A spokesperson for Stairways, Incorporated, a manufacturer of both kits and one-piece units, estimates that freight from the company’s Houston factory to New York would run about $160 for a kit or about $400 for a one-piece stair. Of course, if you intend to hire a couple of workers for three or four hours to install a kit, freight savings can be quickly swallowed up by labor costs. Spiral Stairs of America ships completely assembled one-piece welded spiral stairs from its plant in Pennsylvania to “anywhere a truck or cargo ship will go,” says a company spokesperson. For destinations where freight of a complete unit would be prohibitive, the company also sells stairs that are disassembled into two or three sections. 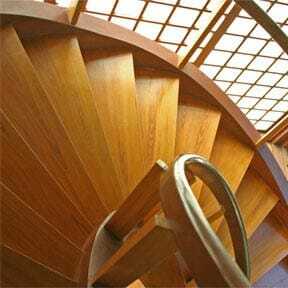 Circular stairs can be built on site by a talented carpenter. Most circular stairs are custom designed for high-end houses and installed during house construction by a talented stair builder. 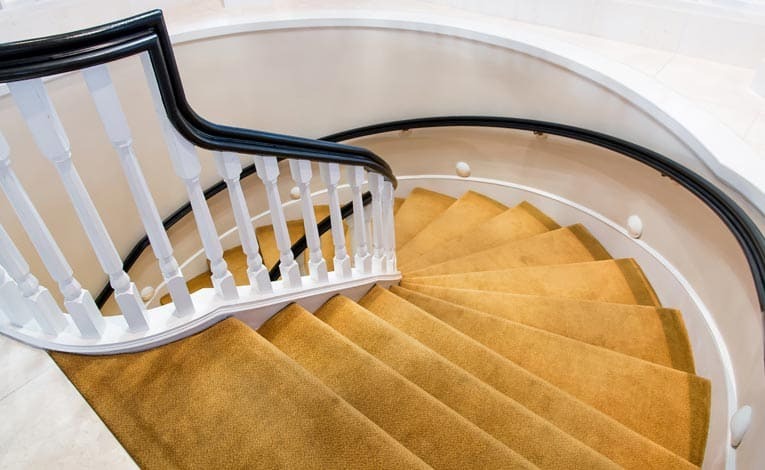 Carpeted circular stair sweeps from one floor to another, providing elegant passage. Some come as completely pre-assembled units. A.J. Stairs, for example, builds fine-quality hardwood stairs from any of several different hardwoods and ships them to the job site on a company truck with a factory-trained driver who supervises the installation, which takes about an hour. Curved walls are built by the job carpenter after the stair is installed.